The European Central Bank helds its first (internal) event on Diversity and Inclusion: “United in Diversity” the 12 th and 13th of June 2017. The main objective of “United in Diversity” event was to raise awareness about the added-value of diversity and inclusion in general as well as about specific diversity facets such as gender, nationality, (dis)ability, ethnicity and sexual orientation. 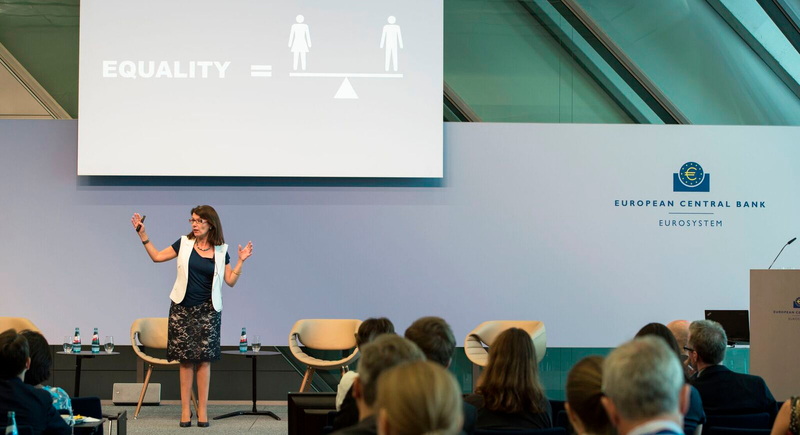 The ECB´s goal was to bring together bright minds and inspirational speakers to give topical talks to all ECB staff on Diversity & Inclusion as well as on the above mentioned diversity dimensions. Six wonderful speakers from academia and public life were present: On Diversity of Thought (Scott E. Page); Unconscious Bias (Michael Page); Gender Diversity (IE´s Professor Celia de Anca); Ethnic and Cultural Diversity (Cecile Kyenge); Sexual Orientation and the Workplace (Martha McDevitt-Pugh); and Disability and the Working Environment (Saliya Kahawatte). The experts shared their background, experiences, knowledge, best practices and insights, empowering ECB ´s staff and business leaders to commit to inclusion & diversity as part of the European Central Bank´s DNA and one of the greatest competitive advantages. What Silicon Valley can learn from Lebanon’s women in techIE Business School Executive MBA Sonia Sánchez Plaza is among 100 gifted graduates in Poets & Quants 2017 Best & Brightest Executive MBAs!